The North American Dota 2 scene continues to see huge roster changes as one of the most promising new teams, Flying Penguins, officially disbanded. 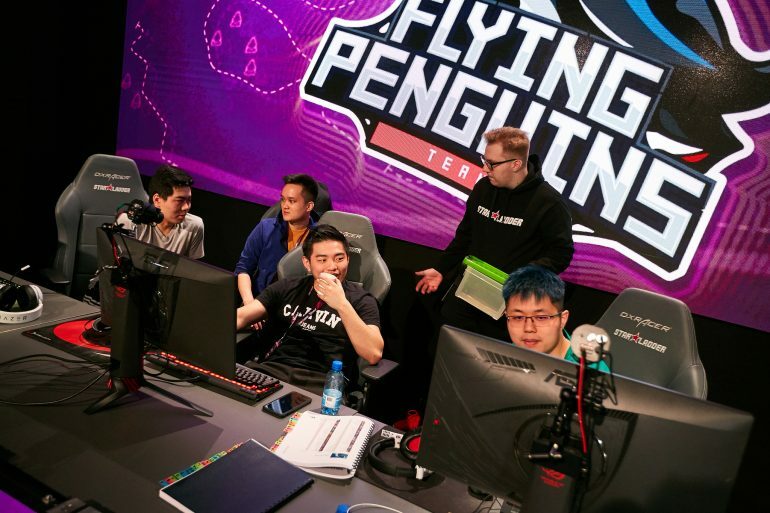 After failing to qualify for the DreamLeague Season 11 Major, several players left Penguins, forcing legendary Dota veteran and captain Jacky “EternalEnvy” Mao to disband his squad. That decision was undone just a day later as three prolific veterans announced that they’d be teaming up with EternalEnvy and Eric “Ryoya” Dong to try their hand in the MDL Disneyland Paris Major Open Qualifiers. David “MoonMeander” Tan, Ilya “Lil” Ilyuk, and Pittner “bone7” Armand all joined the team, but saw no success. In the first round of the NA Open Qualifiers, Penguins were soundly bested by another relatively-small, yet well-known stack, Team Team. That was on March 23—and following their loss, the Penguins roster disbanded once more, this time for good. Several players like Ryoya and bone7 quickly found rosters to fill, but EternalEnvy reached out via Twitter to find a new squad to join. He was even willing to swap regions if necessary. That didn’t end up being necessary, though, as he was approached by the very team that caused his squad to disband. TT had been looking for a replacement for Samuel “Sammyboy” Anderson, their carry who departed the team on March 14—and they even expressed interest in signing Ryoya after Penguins’ initial breakup. But with EternalEnvy on the market, it appears they shifted their focus to add him instead. After their win against Penguins, TT were actually given a direct invite to the closed NA Qualifiers. That let them pull out of the bracket and now they’ll have time to integrate their former opponent into the team. It’s unclear if this partnership will extend beyond the qualifier—but if things go well for TT and they manage to make a push into the next Major, this roster might just stick. TT will be going up against the other top teams in NA, like Evil Geniuses, J Storm, and a new-look Forward Gaming that features a few of EternalEnvy’s old Penguins teammates. Matches begin on March 30 and will run through April 1.